It has been 14 months, and some days are worse than others. Grief Counseling; Something that has been hard to do, but you can find peace in doing it. Grief counseling doesn’t mean just going to a counselor; it can be just talking to friends, family, or even just writing your feelings down. We have latched on to writing, for example this website. This has been one of the best coping mechanisms. When tragedies hit close to home, it is important to watch the behaviors and attitudes of not only the adults, but of the children affected by the event. Let your children know that it is okay to grieve, that it is actually healthy to let your emotions out. In most cases, it helps to find a new normal in life. Though we all know that we can’t bring Joshua back, we let his legacy live on through our memories, and sharing his story. Faith in God; Our Faith has been the biggest help for getting through this. Knowing that we will indeed see Joshua again brings great comfort in our lives. The power of prayer is an amazing thing. Taking time out of your day to pray will also bring great comfort. God works in mysterious ways. Take pride in your faith and don’t be afraid to ask God for help. Talk to him always, on good days and on bad days. He is the best listener. Children are the best advocates. Cj, Joshua’s little brother, is 5 years old today and he too talks about Joshua and the choking game. Don’t be afraid to tell your children about the choking game. Children are more apt to listen to other children. Please do your part and help us spread awareness. Tell a friend, and don’t be afraid to talk to your children about the risks of the choking game. 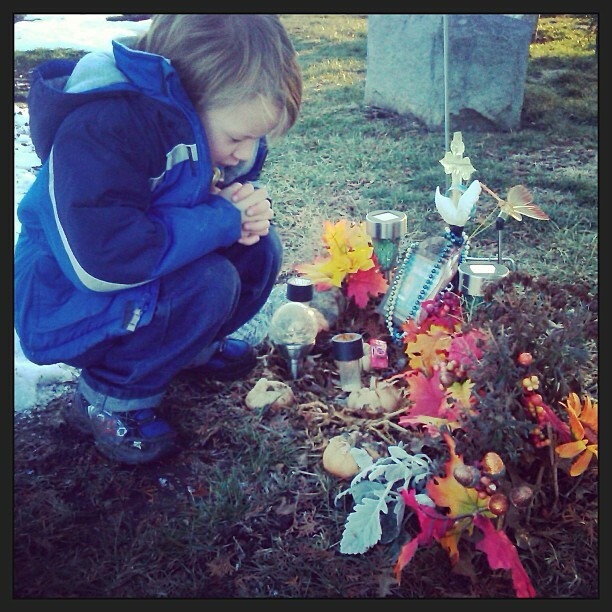 Cj praying at the cemetery.